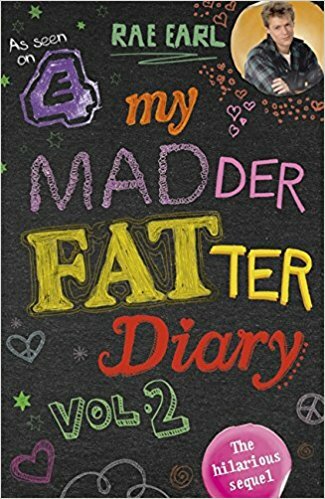 My Madder Fatter Diary is the second collection of diary entries Rae Earl wrote as a teenager. It follows the events after My Fat, Mad Teenage Diary. It’s 1990. Rae has to face her A Levels and figure out what she can and wants to do next. But figuring yourself out is a tall order even when you don’t struggle with your mother, have mental health issues and no proper help with that, when you aren’t fat or in love with the most gorgeous guy on earth. That means that life’s a tall order for Rae, but at least she has the big personality to match it. My Madder Fatter Diary manages to bring Rae’s story to a nice conclusion (as much as you can bring a life story that doesn’t end in death to a conclusion). It’s a hugely enjoyable and emotional read that I absolutely loved. My Madder Fatter Diary feels a lot more unguarded than the first volume of Earl’s diaries. Especially with regards to her mental illness – I’d say she suffers from obsessive compulsive disorder, though I don’t think that she mentions a diagnosis in the book. She both shows more clearly how the illness affected her and in the afterword that clears up some of the last open points, she makes it very clear that she would have needed therapy at that time already, but she only got the proper help only many years later. The afterword was generally important, and not only for closing those story threads. In it, Earl also states without a doubt that losing the weight wasn’t the point of her journey that made life better for her. And that she kept losing and gaining weight for pretty much most of her adult life, moving away from the narrative that if you just get thin, all other problems will magically disappear – a narrative that often haunts fat people. The book also clearly shows how much Rae grew up in that year and that she finally gets to a point where she’s ready to face her own life – even if it’s [SPOILER] without Haddock [/SPOILER]. Which was, all things considered, a good thing for me: she developed and did her own thing. It’s another great argumentation for gap years. If there’s any way you can afford it, do it. Give yourself that time to grow. And all of that with the wonderful sense of humor I’ve come to expect from Earl. It’s simply a lovely read and will speak to anyone who was/is fat, mentally ill and/or a teen. This entry was posted in books, female writer and tagged My Mad Fat Diary, My Madder Fatter Diary, Rae Earl by kalafudra. Bookmark the permalink.